NANCY’S ON CHANNEL 5’s “CHRONICLE” will aired on 10/3 at 7:30 pm. Filmed in late summer with JC Monahan, Nancy’s crew hopes they caught their ‘good side’. Click here to see for yourself. NANCY’S OPEN ON COLUMBUS DAY to better serve her flying customers. NANCY’S PIZZA OVEN has been moved from its summer ‘Wings and Wheels’ venue on the South Ramp to just outside the Café kitchen door. Yummy pizza can’t be far away now! Visit www.nancysairfieldcafe.com for menus, hours, special events and more. Be sure to think of Nancy’s for your upcoming holiday function as well as your next family or business outing. ‘IMC CLUB’ – KICKOFF MEETING will be held in the Magenta Flight Training classroom on Tuesday, 10/22 at 7:00 pm. The Stow Chapter of the nationally operating IMC Club will be providing organized “hangar flying” focused on building proficiency in instrument flying. Monthly meetings will develop safety and proficiency in its members by using real world Scenario Based Learning to engage members and allow them to share and build their experience. Register by clicking here TODAY! You do not have to be instrument rated to attend and benefit! Additional information is available at http://magentaflight.com/imc-club/ I’ll be there, will you? 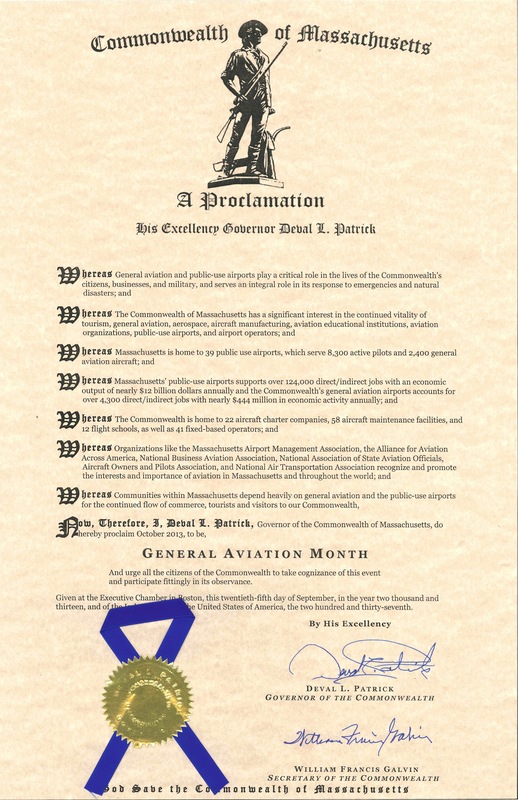 OCTOBER DECLARED ‘GENERAL AVIATION MONTH’ by Governor Deval Patrick. This significant proclamation (click here to see it) by our Governor acknowledges that GA boosts the economy, supports the community and nurtures the environment statewide. As members of the GA community, you can take pride in the many ways GA contributes to our way of life in the Commonwealth. 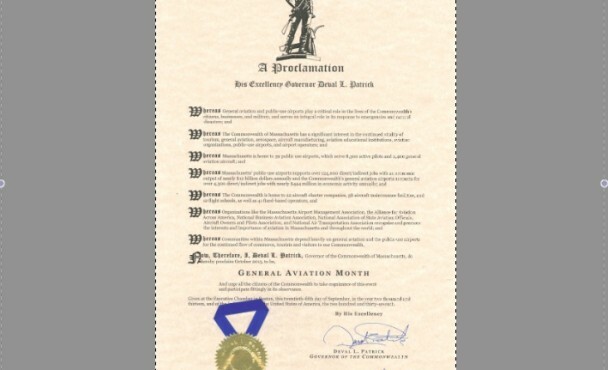 Celebrate this month by taking someone flying with you for their first time! MASSACHUSETTS AIRPORT MANAGEMENT ASSOCIATION (MAMA) celebrated their 40th anniversary and conducted their annual conference at Gillette Stadium in late September. Minute Man’s owner/manager, Don McPherson, had the distinct pleasure of introducing Lisa Piccione, NBAA’s Senior Vice President of Government Affairs and Greg Pecoraro, AOPA’s Vice President of Airports and State Advocacy to the assembled conference attendees. Jointly, they presented on ‘Advocacy’ and left us with many tools to assist us with our local community outreach. Dean Saucier, NBAA’s Northeast Representative, bestowed the prestigious ‘Silk Scarf Award’ to MAMA’s Executive Director, Dave Dinneen and to MAMA itself for their many years of successful promotion of GA in Massachusetts. Congratulations to both Dave and MAMA! ‘WINGS and WHEELS’ wrap-up: A HUGE THANK YOU to the Rotary Clubs of Nashoba Valley, Maynard and Acton-Boxborough for organizing, promoting and successfully conducting this 13 week event. Thanks also to EAA 196, FOMA and our Airport Commissioners for assuring that the event was safe while demonstrating the many ways GA serves the community at large. A special ‘Thank You’ goes to Nancy and her dedicated team of helpers for creating ‘Nancy’s Pie in the Sky’. Yum!!! FOMA’s ‘Hangar Talk’ is set for Saturday 10/5 at 8:30 am at Nancy’s Café. Join aviation enthusiasts, future/current pilots and airport supporters on the 1st Saturday of every month, to learn about GA and share your flying experiences over a free cup of coffee. The conversation will be focused with the return of ‘The Challenge Question of the Day’! So, brush up on your knowledge of all things aviation and join the fun. Make sure to sign up today on their new web site, www.FOMA-6B6.com , so you don’t miss any hot news! EAA Chapter 196 is busy: (www.eaa196.org) On Saturday, 10/12 they will host their Young Eagles Flight Rally (FREE RIDES for children) from 9am ‘til noon. On Monday, 10/28 their monthly meeting will move back into the comforts of the Magenta/Noble AirVentures’ classroom. Please join them. WWW.SOCIALFLIGHT.COM, the brainchild of our 6B6 based Bonanza owner, Jeff Simon, is our newest event posting site as we venture further into ‘social media’. I urge you to visit the site and sign up for the 7-Day Event Planner via email. It’s easy to use (I did it w/o coaching!) and it’s FREE! Pick the WX that meets your personal flight requirements and then schedule a flight to introduce some folks to GA. Consider inviting a fireman, policeman, selectman, reporter, state rep, or senator to go with you. Spread the word about the benefits of GA while having a good time. Call OPS to give or get destination information. Hangar and Office Space available this fall – call OPS for details.